Adam Rippon Cast For Dancing With The Stars [VIDEO] - Joe.My.God. 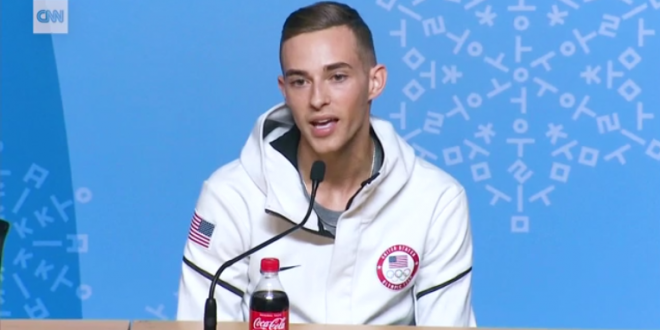 Adam Rippon may be a professional figure skater, but he has shown over the last few months that he has a knack for marketing himself. The openly gay Olympian has been seen on almost every cable talk show imaginable, made a name for himself online, and seen multiple interviewers and fans asking him what he wants to do now that his Olympic run has ended. Now, we know the answer. According to a report from Us Weekly, Rippon will be appearing on the upcoming all-athletes season of Dancing With the Stars: Athletes, along with Olympic snowboarder Jamie Anderson, and former figure skater Tonya Harding.